The Gaithersburg girls team broke two Woodward Relays meet records, but the Paint Branch girls had the best all-around team at Saturday's 47th Woodward Relays. Paint Branch won the girls team title with 63 points over second place Atholton. Gaithersburg broke meet records in the 4x200 and 1600-meter sprint medley relay. 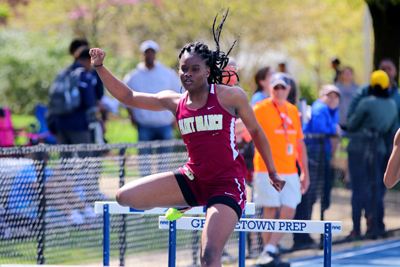 It was a bit of a hike for spectators to watch the shot put, discus, and triple jump, but that is precisely where Paint Branch Head Coach, Dessalyn Dillard, said that her girls won the meet. The shot put and discus were up the hill from the track. The girls triple jump was contested in Georgetown Prep's indoor track facility. "Janise Bestman and Erin Hatcher: they both combined for shot, discus, triple," said Dillard. "Our throwers won both shot and disc, we scored well in long jump and triple jump, and then the shuttle hurdle win helped us out. And then the sprint relays [scored] so yeah it was a good day for them." 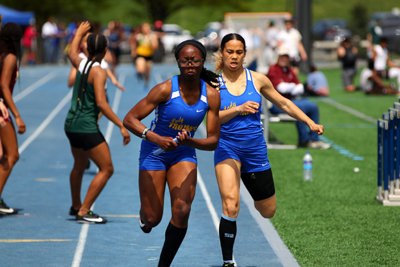 Gaithersburg pulled their strongest field event athlete out of field events to focus on sprint relays. Gaithersburg's K.C. Ashiogwu normally records one or two strong jumping performances, but when she focused only on relays on Saturday, the outcome was brilliant. Gaithersburg swept the sprint relays (4x1, 4x2, 4x4, and SMR) and set meet records in two of the four. "This group we got is special," said Gaithersburg coach, Adrian McDaniel. "These girls have been running together all year long from indoor to outdoor and we knew they had something special. They didn't really know how good they were going to be...As coaches we have faith in them. They do a great job." Any meet record at the Woodward Relays is significant because the meet began in 1973. A meet record signifies superiority over 47 years' worth of performances. With a time of 1:42.43, Gaithersburg broke a 4x2 meet record that stood since 1995. With a time of 4:08.08, Gaithersburg broke a sprint medley relay record that stood since 1996 and broke its school record. Both relays consisted of K.C. Ashiogwu, Desiree McCarthy, Ruth Kamgang, and Michelle Kamara. Elise Durr chipped in on the 4x4 victory. "They hate losing," added McDaniel. "That's the best thing about that. They hate losing so they are gonna be competitive." 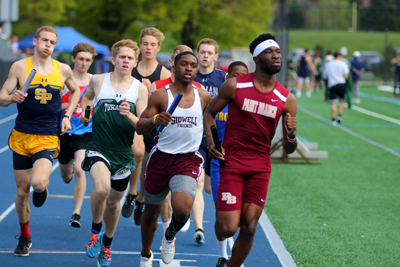 The Paint Branch boys approached a 42 year old meet record, but it gets a little complicated. The Woodward Relays boys sprint medley relay meet record of 3:31.6h was set back in 1977. The 1977 performance was a one-mile SMR, which was nine meters longer than today's 1600-meter SMR. So when adjusted for the longer distance, the 1977 performance still holds up as the meet record compared to this year's 3:31.30 by Paint Branch. When this was brought to the meet director's attention, Greg Dunston believed that both performances should be considered meet records. Coach Dillard from Paint Branch did not care about technicalities or the meet record. She was hoping for good individual splits from her boys. "We were just focusing on individual," said Dillard. "We wanted to hit 49 [in the opening leg]. We hit 49. We wanted 21 out of Chimdi [Chukwumdi Osuji]. We got it. 22 out of Justin [Justin Page]. We got it. We wanted Joe [Joseph Okonofua] to either match or exceed what he did earlier today [1:56]. He was within a second of that so I was like, 'alright!'" Paint Branch was also pleased with a 7:59.38 season best 4x800 behind first place Chopticon's 7:53.85. Dillard was fine with her boys not taking the victory. "We weren't really sure what to expect," said Dillard, "so just to get out there and then they [Chopticon] broke away on that second leg, that was just a nice little reality check for our guys, like they have to step up a little bit and give a little more." Paint Branch gave a little more in the final scored event of the day, the 4x400. Facing a deficit behind Gilman on the final leg, Paint Branch battled back to win the race in 3:21.94 in one of the most exciting moments of the day. Despite multiple event victories by Montgomery County schools, Gilman School from Baltimore won the overall Woodward Relays boys team title with 89 points over second place Gaithersburg. 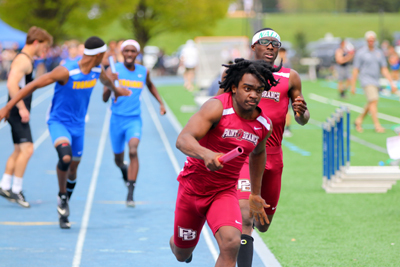 Sherwood flexed its muscles in the sprints, winning the 4x1 and 4x2. Paint Branch won the 4x4, SMR, and 4x1600. Gaithersburg won the shuttle hurdle relay, the high jump relay, and the long jump relay. 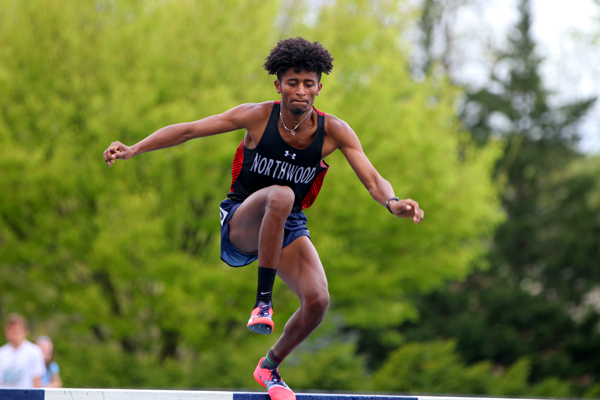 Northwood High School's Obsaa Feda smashed the meet record in the 2000-meter steeplechase with a time of 6:09.20. The previous meet record was 6:18.61 set in 2012. Gaithersburg’s boys 4x8 did not disappoint with their 8:17 performance.